Thoughts on AI: Can we spot and overcome human bias in AI? Massachusetts Institute of Technology and Stanford University researchers recently found that three commercial facial analysis programs were producing different results for different skin types and gender. They found that error rates for determining the gender of light-skinned men were 0.8 percent while error rates for darker-skinned women increased to up to 34 percent. Unfortunately, this is not the only example where AI seems to lose neutrality. Biased algorithms threaten to erode trust in AI platforms. Problems can arise when bias exists in the original data on which the algorithm is trained. Also, even unintentionally, biases inherent in humans training the systems can surface in AI. At Think 2018, IBM researchers predicted a future where we can trust our data to be secure and our AI free from prejudice. And that’s in our best interest, according to Francesca Rossi, the IBM AI ethics global leader. Most current AI systems do, in fact, exhibit bias, she told an audience who gathered for IBM Research’s five in five, which detailed five technologies that would change the future. She said that engineers who don’t deal with data bias now will find themselves losing out on potential AI gains. Researchers report that machine learning algorithms will pick up on any predisposition in the data they are given to learn from. It is easy for bias to be unwittingly introduced into those algorithms by their designers. As experts have pointed out, bias can only be discovered during rigorous testing and constant monitoring of the models. But that doesn’t provide a guarantee that bias won’t crop up at some point. Let’s revisit facial recognition errors seen in some AI platforms. To train a system neutrally, you would likely want to teach system to be able to recognize a large, diverse set of faces ranging in age, gender and race. According to Rossi, the system should learn how to differentiate between faulty data bias—where insights are derived from incomplete or inaccurate data sets—and bias inadvertently introduced by the researcher. Can AI bust stereotypes and expectations with neutrality? Rossi and other experts note that you need to be aware of the danger of potential bias and inaccuracies. But to solve bias problems, you might need to rethink your AI team, ensuring your researchers reflect a variety of backgrounds and perspectives—just like the people represented in your data set. As observers point out, the pitfalls of poorly-built algorithms can potentially create real-world problems. The failure to address them impacts both effectiveness and perceived return on human and capital investments. As many companies begin to climb the ladder to AI, the demand for ethically-sound and neutral algorithms could very well instigate a sea-change in the way companies approach machine learning. Interested in exploring more of the issues surrounding ethics and AI? 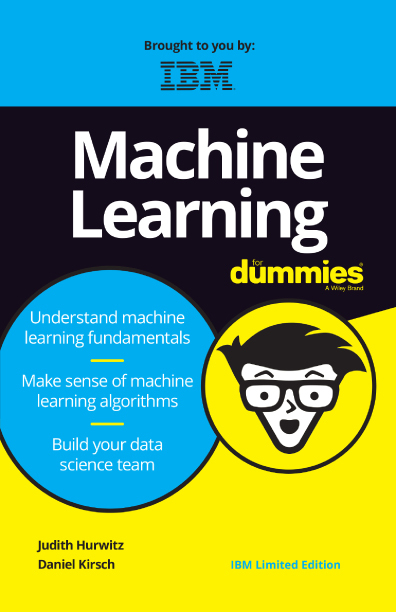 Our no-cost “Machine Learning for Dummies” ebook can teach you how to get started removing biases and how to work with trusted data. Ready to jump onto the ladder to AI for your business? Watch our webcast and request a no-cost consultation.